If eight hours don't seem enough for you (original title of the article), try to work at an assembly line from ten o'clock at night till six o'clock in the morning with three breaks of ten minutes. With the lunch break taking place during the last half an hour of your shift, unless productive recoveries are needed. In 11 minutes you cook a plate of spaghetti. In the same time eight Fiata Panda need to be produced. During the day, at night, from Sunday evening at ten o'clock till the same hour on Saturday, so to produce 120 thousands cars by the end of the year. The name of the factory is famous: Giambattista Vico (added: this factory is in Pomigliano d'Arco, in the South of Italy, where recently the main Italian unions have signed an agreement with Fiat to bring the production of Fiat Panda back to Italy from Poland ) . The PhilosoFiat that will be practiced in the factory from 2012 is based on a simple concept: production can't stop. The production of Fiat Panda will be brought back to Italy in return for a drastic worsening of quality of life, everything will have to subdue to the requirements of the assembly line. And so it comes spontaneous to ask whether there is something wrong in a world that in 2010 still puts the needs of machines before those of people. In Pomigliano they will work on three shifts (6-14, 14-22, 22-6), six days per week, for a total of 18 shifts per week. They won't work on Sunday, so that the company won't have to pay overtime. Breaks won't be individual but collective: ten minutes for all, for three times per shift. The lunch break won't be anymore half during the shift but at the end. So who will start working at six o'clock in the morning will have to wait till half past one to have a bite. This will happen unless something goes wrong: the company can call off the lunch break to ask its employees to work overtime in case the production will need it. There will be weeks when you'll work six days, from Monday to Saturday, switched with others when you'll work four days, with two days off alternated between Monday and Tuesday, then Wednesday and Thursday, and finally Friday and Saturday. With an organization of shifts like this, in order to have a normal Saturday and Sunday off, one will have to wait six weeks. 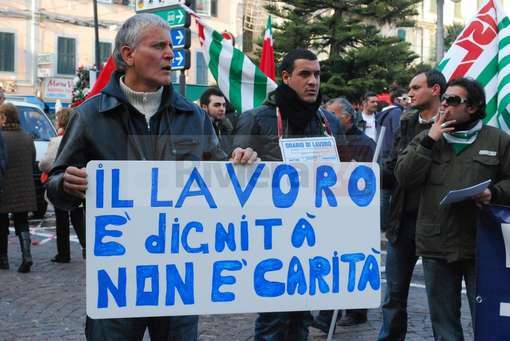 Workers will get paid 3000 Euros more per year because of overtime and the discomfort. But the question is: does a life subdued to the need of machines make any sense? This model alternates work with rest and dosn't seem to consider Life. Why do we keep reasoning in terms of eitgh hours working day as if eight hours in an office are comparable to eight hours at an assembly line?An organization based on four shifts of six hours each could be better to cover the 24 hours. To switch from three to four daily shifts would increase by at least 10% and potentially by a third the necessary working force, in the name of the famous principle that if you work less, more people work. If one every two workers decided to shift from 36 to 30 hours, 1000 jobs would be created. To sum up: you work less, more people work, producing at the best. thanks for a much for the translation. It will be interesting to see if people put up with these conditions - bosses will try to use the constant threat of moving production back to Poland to keep control. There are some letters from Polish Fiat workers to Italians on here as well, worth a read.